If you did most of your growing up in the Sunshine State like I did, chances are good you’ve eaten at a Sonny’s BBQ. Before quick-serve Subway-style counter lines or dozens of signature sauces were big deals for barbecue establishments, dozens of Sonny’s dotted big (and not-so-big) highways across the Southeast, especially in its home base of north Florida. It was heavy on the helpings but light on the frills. That was, until today. A PR agency invited me to come out to celebrate founder Sonny Tillman’s 88th birthday. In honor of the High Springs resident, who founded his first eatery on Waldo Road in Gainesville (still smoking today) in 1968, the chain marked down its St. Louis Rib dinner to … wait for it … $8.88 (down from $12.99). A clever hook … well, at least clever enough to get a hungry reviewer—on his day off—to drive to Sonny’s refreshed Kingsley Avenue location in Orange Park. 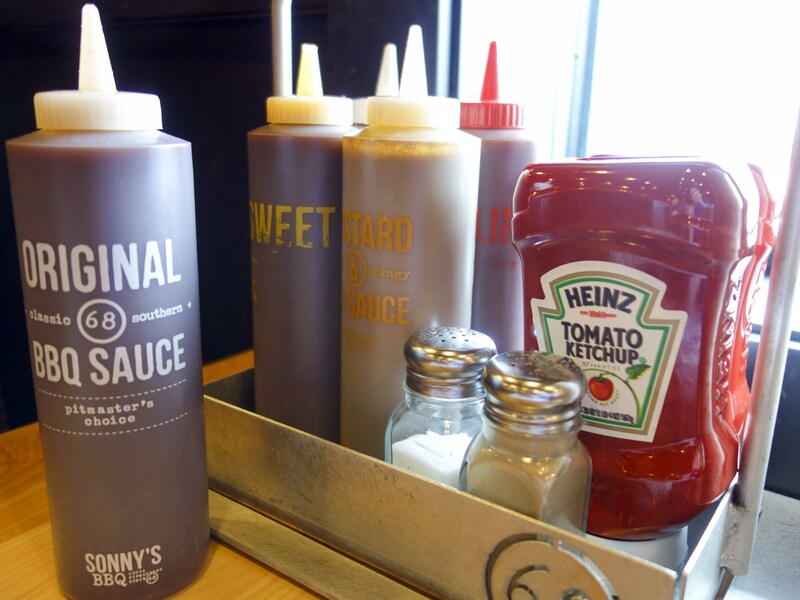 It turns out Sonny’s went through a big-boy rebranding in 2013, freshening its logo, menu, décor and attitude. As a Southern institution for nearly 50 years, I won’t say the new Sonny’s is hip or edgy. It’s done what it has to do to remain relevant to its loyal fans—a table tent lauds “senior lunch specials”—and also attract new barbecue aficionados. In fact, the brand celebrates its longevity with the tagline “local pitmasters since ’68” featured prominently in its logo. That’s a nice differentiator, too. And true to the tagline, all meats are smoked around the clock on premises. The OP location, at 1976 Kingsley (which coincidentally opened in 1976), feels much like an olden-days Sonny’s – one main full-service dining room with a wooden half-wall bisecting rows of booths, a separate bar for beer and wine and to-go pickup area. The wall décor is less kitschy roadhouse and more modern, with barbecue mottos and photos of Sonny’s employees and Sonny himself through the years in tasteful dark-wood frames. I got a taste of the menu freshening with three appetizers. 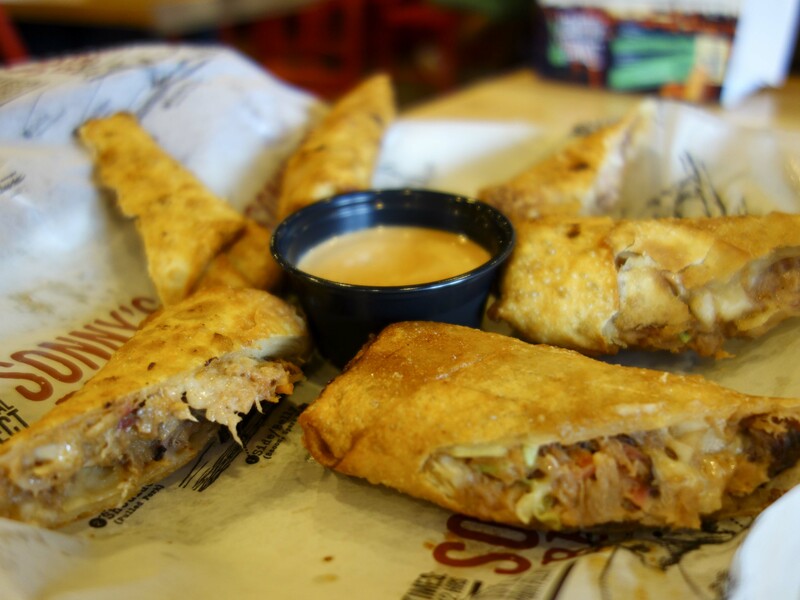 The Redneck Egg Rolls ($6.59) gives you three sliced halves of what look like mild-mannered fried rolls, but these are rolled up with a tasty blend of pulled pork, coleslaw and pepper jack cheese. The smoky Ranch dressing dipper is a nice addition. 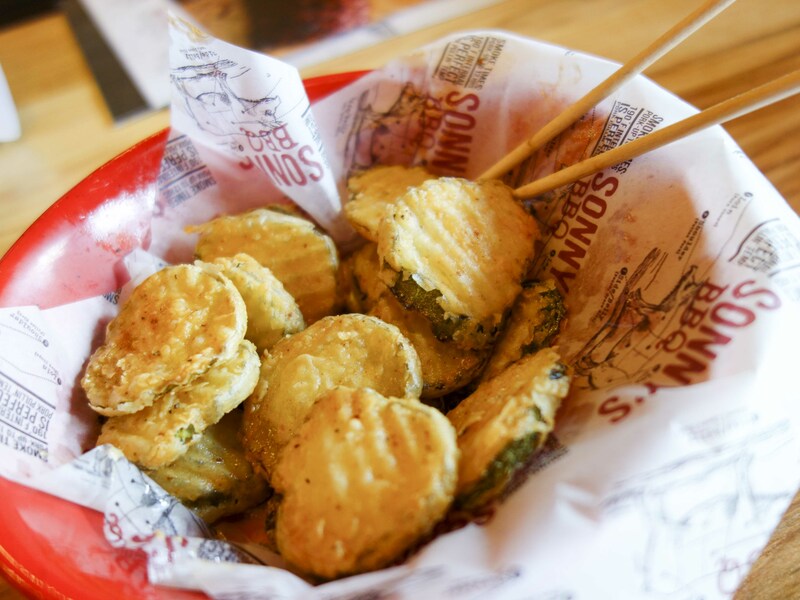 The Fried Pickles ($4.99) gives you a basket of thin, lightly battered dill slices, also served with smoky and standard Ranch and a bunch of wooden spears. All fine and good, although I would have liked these slices to be cut a tad thicker. 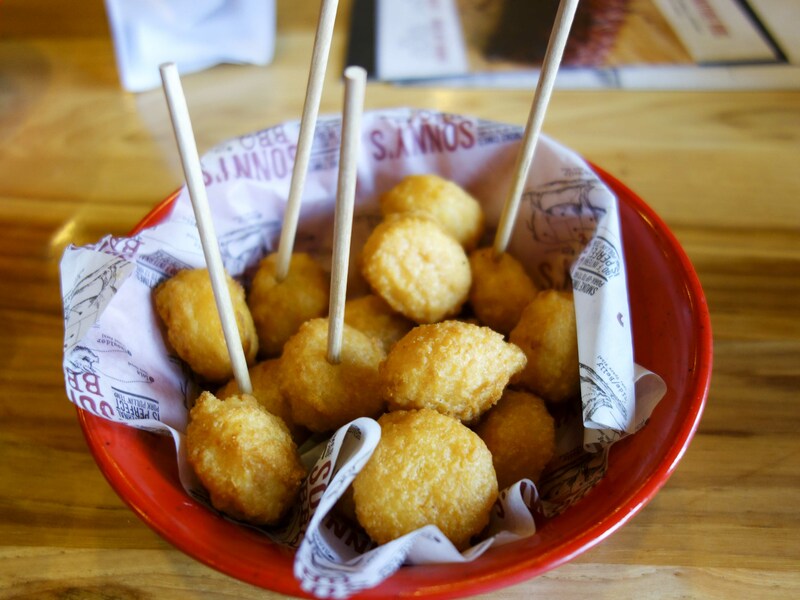 The Corn Nuggets ($3.99) are perfectly golden spheres concealing creamy, sweet kernel corn. They were easy to love and equally fun to spear, dip and eat. I ordered my ribs Sweet & Smokey and got a platter of five petite sliced ribs with a big slab of garlic bread. The ribs weren’t sauced over the top, which my fingers and I appreciated, and it gave me a chance to sample most of Sonny’s six sauces (say that five times fast). 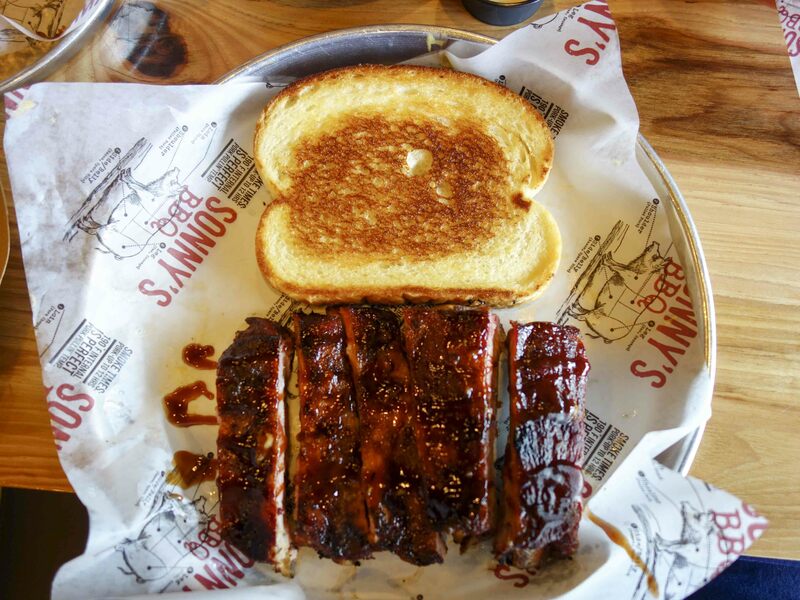 For my rib-soakin’, go for the bottle of Smokin’, a tangy, spicy number. The ribs held plenty of meat and were a healthy portion—not too much food but just right, even for someone who knows how to pack it away. 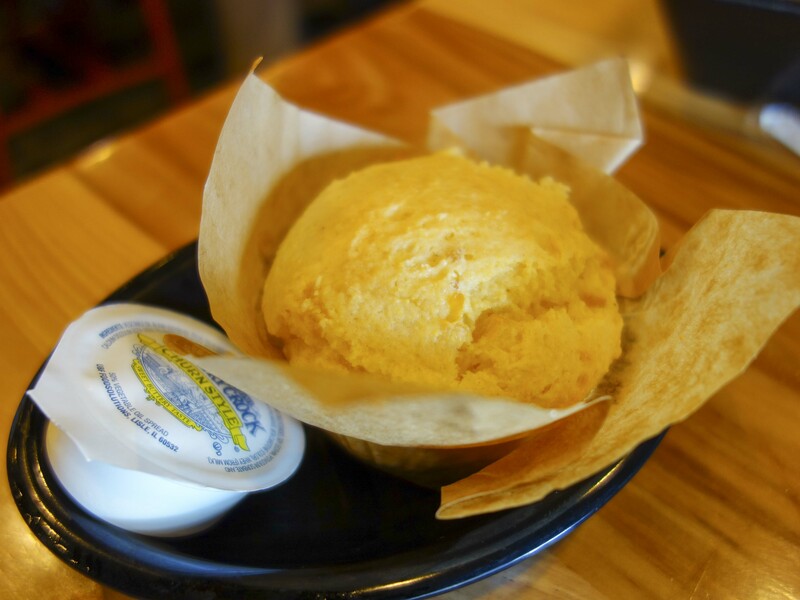 If you’re a cornbread fan, don’t miss Sonny’s corn muffin, which came with my entrée. It’s hot, moist and satisfyingly sweet. The kind you pick apart gleefully with your fingers, then lick those fingers because it was too hot to dig into. I would choose it over the garlic bread actually. Speaking of sweet, don’t miss Sonny’s signature sweet tea ($2.59 for a huge glass). Even for this relentless sweet tooth, I was grateful that it wasn’t a coma-inducing formula (I’m looking at you, Publix Deli), because the sugar shock takes away from the brewed tea enjoyment. It was a nice compromise. Finally, dessert. 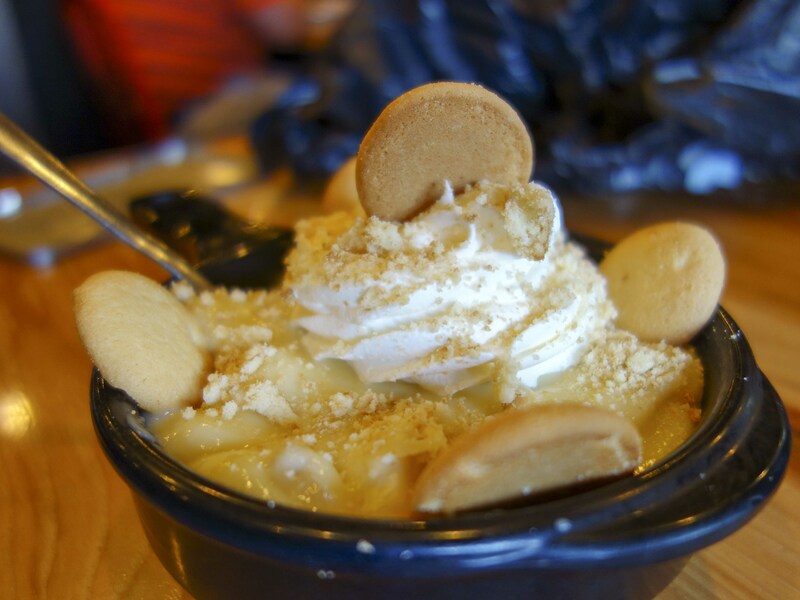 Two options live on this menu—Banana Pudding and Fruit Cobbler. I went for the former ($3.59), a seriously sharable bowl of creamy pudding studded with bananas and crisp vanilla wafers and topped with more than a dollop of whipped cream. Sonny’s may have freshened up some parts of its menu, but thankfully they did not mess with this classic sweet treat. My trip to Sonny’s was a nice reunion, one that was long overdue. It’s great to see that they stayed true to their classic-BBQ roots but gussied up the brand and menu to remain a force in an increasingly crowded smokehouse. Note: My Sonny’s lunch was provided to me at no cost, aside from a voluntary table gratuity for my very attentive server, Lisa. I was not compensated monetarily for this review. 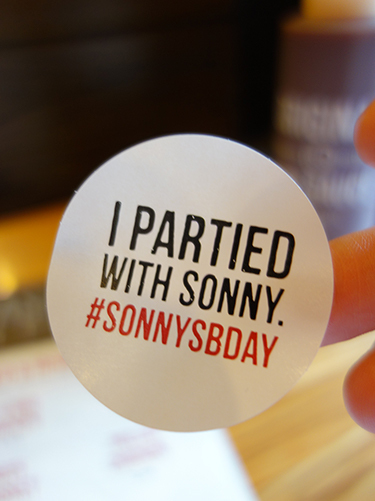 August 14 is Sonny’s BBQ founder Sonny Tillman’s birthday. Sonny’s invited me to join in the celebration.